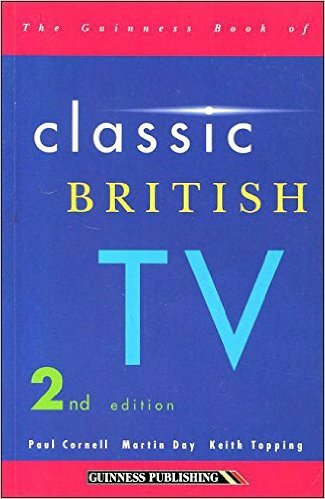 Curious British Telly: New Book is Here! 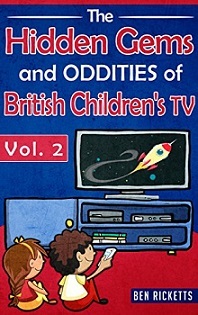 The latest edition in my series of guides on the more curious gems and oddities of British children's TV is now available on Amazon for the bargain price of 99p - that's cheaper than anything you'll find in Poundland, yet offers infinitely more value than a refurbished Chris De Burgh CD. Now, why exactly have I started writing these books? Obviously, this website acts as a fairly useful mouthpiece for me to communicate my love of retro British television, but I wanted to do something a little different to run alongside it. What could I do though? Hmmm, well, what really inspired my love of British TV history? And you know what it was? Petty crime. Yes, that's right, I'm a criminal in the eyes of the law, because back in 1997 I borrowed the quite amazing 'Guinness Book of Classic British TV' from the local mobile library and NEVER returned it. Remember, this was back in an age when the internet was a strange digital beast that you were lucky to catch a glimpse of. Therefore, this book and it's incredible depth of knowledge was a rare gateway into a world of TV nostalgia. And I think this why the local council never even sent me as much as an overdue notice, they had the foresight to see where it was leading. So, at the start of 2016, I decided to start releasing mini guides in homage to this wonderful book by Paul Cornell, Martin Day and Keith Topping, my front covers even owe a heavy debt to the colour scheme of the Guinness book. Obviously, I had a wealth of material on my blog, but some of the earlier blogs I wrote were a little on the hoof and lacked detail. So, although it meant starting from scratch again, I decided to rewrite them with a little more clarity and probing insight. Now, these e-books are rather short in length and, accordingly, the writing doesn't take that long. However, the research takes a LOT of time. Obviously, I have to watch the TV shows (which sometimes involves heading down to the BFI Archive in London) and then I have to look into their backgrounds by flicking through old copies of the Radio Times, newspaper archives and the occasional trip to the BFI Reuben library. Luckily, I find all of this incredibly fun and the thrill of discovering a long forgotten fact is like catnip to me. Most of all, though, I love tracking down the people involved with these shows and interviewing them to get first hand insights into the production and stories behind the shows. And, sometimes, this involves chatting to people who absolutely lit up my childhood such as Mike Amatt or Tony Robinson - a fact that would absolutely melt the mind of the three year old me. Sadly, I can't always secure interviews as, due the age of some of these shows, the people behind them are no longer with us. Nonetheless, you would be surprised at the number of people who, forty years on, are still fully immersed in the world of British TV. And that's the story behind them. The latest one has a few exclusives in terms of interviews and even a number of shows which have never been covered on here. Now that this one is complete, I'm going to take a microscopic break before compiling the first two volumes on British children's TV into an actual physical book that you can read on the bus or even on the toilet; there's going to be an additional five shows featured, so it's going to be pretty special. Following that, I'm going to start working on volume 2 of my books on British TV comedy, so the future's bright, but the past, quite obviously is much brighter. Thanks for the support, David! Hope you enjoy the books!